Feeling overwhelmed by new technology? Would you like to learn how to use your computer or smartphone safely and confidently? 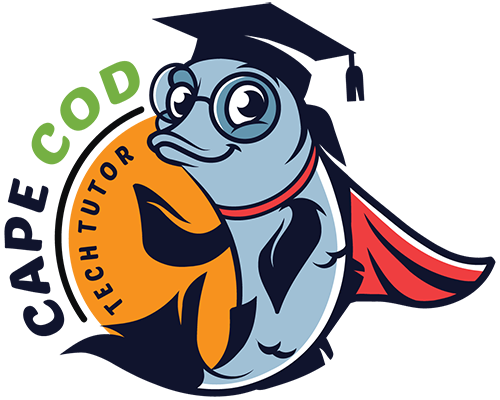 Cape Cod Tech Tutor can help! Our patient, qualified teachers have over 15 years experience offering side-by-side or remote technical tutoring. Tutoring also makes a great gift for parents and grandparents, contact us for package-pricing! New phone and computer setup, safe usage, digital photo, video and music management, video teleconferencing, word processing and other services. Computers don’t discriminate by age, so get started today! Specializing in Apple products! New computer set-up, patient computer training, software lessons and diligent computer use to prevent cyber attacks. How to use your new smart phone for texting, to surf the web and safe use of apps for every day productivity. Specializing in Apple iPhone! Digitize and organize your photos and videos and do it all ‘in the cloud!’ Cape Cod Tech Tutor can show you how! Specializing in Apple Photos® & iMovie®.